4am - It's cold outside! In Apple Valley, it's 52℉. For a Southern California born and bred guy like me, that's cold! I went outside in order to "field test" Scampy's new Wave 3 Catalytic Heater. So, there I am in my PJs, starting up the Wave 3. The first thing that was not right, was the pilot light. It looked too small? I kept trying to light that Wave 3, and it did not appear to be lighting. To check if it was lit, Scampy's interior lights were turned off. Better to see if Wave 3 was glowing in the dark. No glow! This propane tank could NOT be empty! Could it? To check how full this propane tank is, the gas meter from Scampy's outside tank was brought inside and hooked up. Meter was "right on" empty! Darn! But Tioga George is not stymied by this! Not him! The inside propane gas hose was pulled outside, thru Scampy's door, and hooked up to the outside tank. Then lighting up the Wave 3 began again. And again the Wave 3 would not light!! The propane level meter which was now on the empty inside tank, was removed and taken outside to put it back on the outside tank. The meter read empty! PS: It is now 4:45am, and I'm in the middle Blogging the story above. I asked myself, "Did I turn off that outside tank valve?" Going outside to check that outside tank, I found that I did turn off the valve. But, out of curiosity, I turned on the propane to see what the level meter read. It now read, "Half Full!" Leaving Scampy at our Lone Wolf RV site with the battery charging, we headed out for breakfast. There is breakfast joint that is a couple doors from our 24 Hour Fitness gym that is very good. Sundays at breakfast joints are crazy with customers. 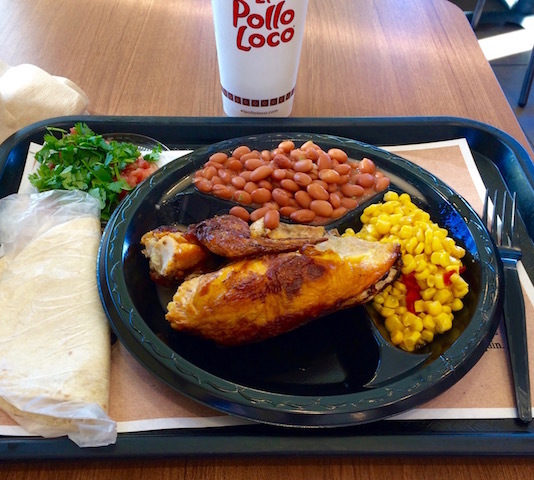 El Pollo Loco food is healthier. Hmm a mystery.... hope it is resolved soon. Funny thing, by noon that propane showed full-up. Sounds like the regulator, George. They do go after awhile. Might be a bad regulator. But this regulator is barely used! I miss El Pollo Loco! If El Pollo wasn't all over the place up here, I'd be missing that place too! Wow, what a difference in prices. This summer in San Miguel de Allende I ate at your favorite spot, Pollo Feliz. I had a two piece with 2 garnishes, salad bar and a drink for 62 pesos or $3.44. Sí, prices in Mexico are way cheaper! George, those screw on propane "level" gauges are just about worthless. They measure the gas pressure and the pressure is determined by the tank temperature, not how much propane is in the tank. Propane is stored in liquid form with a gas bubble on top. When you draw out some gas, more liquid boils off to take its place so the pressure stays the same until all of the liquid is gone. Liquid propane is 270 times as dense as the gas, so what you want to know is how much liquid propane is in the tank. When the liquid is gone, the tank is effectively empty. To find how much liquid propane is in the tank, pour a cup full of hot water down the side of the tank and then run your hand along the side. The metal with liquid behind it will cool down much faster than where there's gas. The liquid crystal level strips you can buy work the same way - you pour hot water over the strip and they change color where it's against the gas. Love the George Carlin, love your blog, love your attitude!! !